Light Transducing Membranes: Structure, Function, and Evolution covers the proceedings of a joint United States-Australia conference held in Honolulu, Hawaii on December 1977. Organized into four parts encompassing 19 chapters, the book focuses on structural, functional, and evolutionary aspects of light energy transduction by membranes. The first part of the book explores the problems of how membrane-related biomolecules could have evolved prior to the origin of life, how amphiphiles might have become organized in lipid bilayer structures, and what mechanisms may have been available for light energy transduction. The mechanisms by which ions, lipids, and proteins interact in membrane systems are described in the next part of the book. Some chapters in the third part of the book cover the analysis of several bacterial membranes as reconstituted, light transducing systems, providing a new tool for investigating basic mechanisms. Relevant aspects of mitochondrial energy transduction are also covered. Finally, the last part presents mechanism analysis by which intact bacteria and chloroplasts interact with light energy, which represent the end product of several billion of years of evolution. 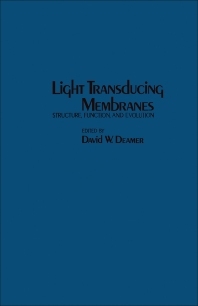 Biological evolutionists, biologists, researchers, teachers, and students who are interested in various aspects of light transducing membranes will greatly benefit from this book.